These are poems of faith and hope, and the inner struggles we all face as we pilgrim toward virtue and nobility. I pray that my poor writings inspire and bless others. I have been published in some magazines and collections over the years. Thank you for visiting and reading my poem. I hope you enjoyed it and that it blessed your day. Please see the sidebar for my best-loved poems, I am sure you will enjoy them too. 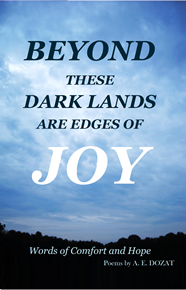 If you are in need of encouragement or know someone who does you should order a copy of my book, BEYOND THESE DARK LANDS ARE EDGES OF JOY, today, you will glad you did. $9.62 Plus shipping, CLICK HERE for my Amazon page. This is a short poem with an obvious meaning on the surface but if you take the time you may see something underneath. I like to write poetry about God, life and the blessings He gives. This poem is still about God but in an indirect way since it is about His creation. What is a good gift for someone who needs encouragement? The book, BEYOND THESE DARK LANDS ARE EDGES OF JOY, WORDS OF COMFORT AND HOPE. If you or someone you know is going through a difficult time and needs encouragement then buy give them a copy of my book, you will be glad you did. The wealthy princes and kings. Thank you for taking the time to stop and read my poem, I hope it blessed your day. To see more like it see the favorites in the sidebar. Shared with our hidden selves. And He would rescue us. Come to me, all you who are weary and burdened, and I will give you rest. Matthew 11:28, NIV. Thank you for visiting and reading my poem. I hope you enjoyed it and that it blessed your day. Please see the sidebar for my best-loved poems. For digital downloads follow this link to CLICK HERE. Click the image to order a copy of my Illustrated poems.